There are so many yoga mats on the market, it can be really hard to choose the one that’s right. As a yoga teacher, many students and friends ask about the best yoga mats to use. Without a one-size-fits-all answer, it takes a lot of research to find a variety of options to recommend for other yogis to be using. Just as there’s not one style of yoga that fits all yogis, we believe there is not a mat that fits all yogis either. Here, we share the information we found that can help you to choose the qualities that are most important to you. Hopefully, you’ll be able to find your perfect MATch. 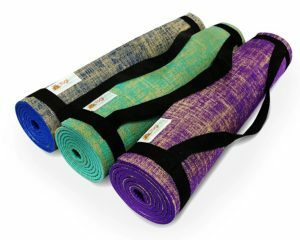 While searching for the best yoga mats available, we factored in several qualities, including: price, material, mat type, size, thickness, weight, odor, color options, and warranty. 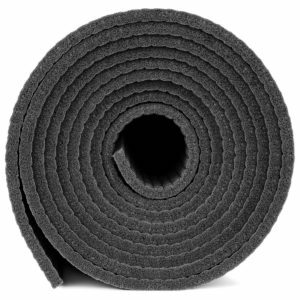 We also included a Yoga Mat Buying Guide at the bottom of this review if you’re not sure how to prioritize the qualities listed. For more details about each mat, click on the mat name. It would be difficult to include every yoga mat in our list, so we’ve included some of the mats we’ve done extensive research on – or personally used! 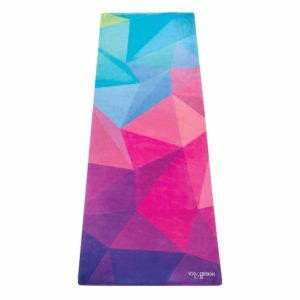 Take a look at our top yoga mats in 2019. For years, teachers and students worldwide have enjoyed the benefits of Manduka mats. The PROLite is a pleasurably dense, yoga mat moderate in size but superior in comfort and padding. This is a closed cell mat made with PVC using a non-toxic, emissions-free manufacturing process. It is latex free. In general, the width, thickness, and weight of the PROLite from Manduka feel near the middle of the group of mats listed. The length of the Long option is only matched by the Manduka eKO and surpassed by the Manduka PRO. The PROLite was built similarly to the Manduka PRO, but both lengths of the PROLite are two inches more narrow and 1.1 mm thinner than the PRO. These differences have the lite model weighing in at 3.5 – 4 pounds less than the PRO – definitely something to consider if you carry your mat around with you often. Some mats get lots of reviews including how bad the mat smells – the PROLite was not one of them. This is not to say it is odorless, it just suggests that if it does have an odor, it may be light and it likely doesn’t last long. The PROLite comes in a wide variety of colors, including ones that are opalescent. The Standard has 17 options to choose from and the Long has 2 options. Manduka was founded in 1997 by Peter Sterios, an architect turned yogi. He designed The Black Mat and gifted it to teachers he respected and admired to show his gratitude. They passed the mat along to their students and a company was born. The name Manduka was inspired by Mandukasana (frog pose) a pose his teacher and mentor, Shandor Remete, always included in practice. Manduka prides itself on putting the customer and environment above all else and works to demonstrate their commitment to sustainability. 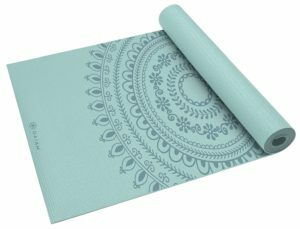 This is Aurorae’s flagship eco-friendly thick yoga mat that includes a focal point moon design to help you maintain focus during your practice. This is a open cell mat made with a new biodegradable, hypoallergenic resin (eco-safe patented PER) that doesn’t emit chemicals or gases which means your mat does not emit any toxic chemicals or gases and is free of rubber, silicone, and latex. The Aurorae Classic Thick comes in one size: 72″ x 24″ and is 6.35 mm thick. This size is comparable to many other mats reviewed here but the thickness of this mat is a one of the largest on this list. Surprisingly, the shipping weight is only 3.2 pounds which makes it one of the lighter mats here. Since this mat is made with a resin material, it is practically odorless. One reader even mentioned that it doesn’t absorb odors either, which is a big plus for anyone who sweats a lot during their practice. There are 12 color options available and each of them feature Aurorae’s classic focal point moon icon. Aurorae is a family run business founded by a yoga student and cancer survivor, Dennis Ingui. Dennis is a dedicated student of yoga who has enriched his life using yoga and understands what a regular, everyday student needs for their yoga practice. Their #1 goal is to provide the best in customer satisfaction. This is the PROlite’s big sibling. Sometimes referred to as The Black Mat, this luxurious mat is not the thickest on the list but it has an incredible density which is great for comfort but not amazing if you carry it with you often. The slimmer PROlite, this mat is built for life and is backed by its Lifetime Guarantee. This is a closed cell mat made with non-toxic PVC and is created using an emissions-free manufacturing process. It is latex free. The Manduka PRO comes in two sizes. The Standard measures in at 71″ x 24″ and weights 7.5 pounds. The Extra Long is 85″ x 26″ and tops the list for weight at 9.5 pounds. Both sizes are moderately thick at 5.8 mm but the weight of these mats proves that the material is dense. I did not find many reviews about the odor of this mat. Like the PROlite, I would assume that means there’s a slight odor but it probably fads relatively quickly. There are 9 color options available for the Manduka PRO. 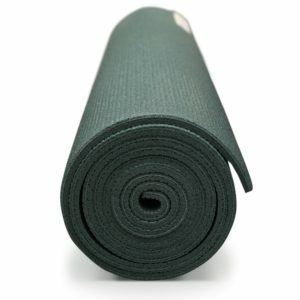 Jade Yoga makes a variety of mats and this is their most popular. Since it is an open cell mat, it absorbs sweat and can be more slip resistant than other mats (especially new, closed cell mats). Jade Yoga takes pride in providing products that are sustainably produced and eco-friendly. This is an open cell mat made with natural rubber from rubber trees, which is a renewable resource. It does not contain PVC, EVA, or other synthetic rubbers. Also, it’s made in the United States of America. The Jade Harmony Professional has two size options. The smaller one is 68″ long and the larger mat is 74″ long. Both lengths are 24″ wide and 4.7 mm thick. According to their website, they weigh about 5 pounds each. Many reviews complained of a strong rubber smell that sticks around for a while. The website offers suggestions for how you can help the smell to fade more quickly but they also give a friendly reminder that the mat is rubber and like all rubber things, there may be a lasting odor. There are 7 color options available for the 68″ mat and 6 options available for the 74″ mat. 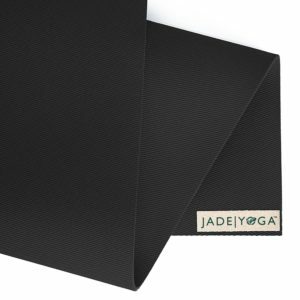 Jade Yoga began in 2000 when a savvy yogi came to them with complaints about plastic and PVC mats. Jade had been making non-slip rubber rug pads since the early 1970s and used their process to provide a natural solution for yogis. In alignment with their commitment to being eco-friendly, they plant a tree for every mat sold through their partnership with Trees for the Future. They also have Color Causes, which links various mat colors to organizations they make donations to. They also have community partners and giving days. And, all mats are made in the USA. Gaiam created this mat to be extra thick, but it falls in near the middle of this list as far as that measurement is concerned. It’s also one of the smallest mats on the market. 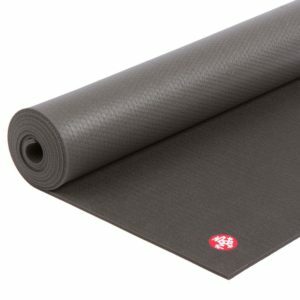 Luckily it is lightweight, although unlike the Manduka mats that means it’s less dense and may not provide the same level of comfort. These mats are intended to have a non-slip surface. This is an open cell mat made with a new biodegradable, hypoallergenic resin (eco-safe patented PER) that doesn’t emit chemicals or gases which means your mat does not emit any toxic chemicals or gases and is free of rubber, silicone, and latex. The Aurorae Classic Thick comes in one size: 72″ x 24″ and is 6.35 mm thick. This size is comparable to many other mats reviewed here but the density of this mat is a one of the largest on this list. Surprisingly, the shipping weight is only 3.2 pounds which makes it one of the lighter mats here. There are 12 color options available and each of them features Aurorae’s classic focal point moon icon. This family-run business is on a mission to satisfy its customers and so offers a 2-year guarantee. Gaiam is a leading lifestyle brand on a mission to make yoga, fitness, and well-being accessible to all. Pronounced “guy-um”, it represents planetary awareness, preservation, and support of the interconnectivity of all living things. This is Manduka’s eco-friendly mat and it’s said to have a grippy surface that catches if you begin to slip. It’s made from natural materials and is consciously designed to support your practice and the Earth. This mat has open cells on the top and closed cells on the bottom and the two layers are melded with a heating process to avoid toxic adhesives. It’s made with biodegradable, non-Amazon harvested, natural tree rubber along with non-toxic foaming agents and non-AZO dyes. The material is 99% latex free and generally safe for people with sensitivities. Scrap pieces are used for the production of other materials which means the manufacturing process is zero waste. Like other Manduka’s this mat comes in two different sizes. The Standard is 71″ x 26″ and weighs 7 pounds. The Long is 79″ x 26″ and weighs 8 pounds. Both of them are 5 mm thick. Yes, as with other natural rubber mats, this one comes out of the box with a strong odor. Some reviews noted that it fades after use and cleaning. The Standard has 9 color options and the Long has 2 color options. Yoga Design Lab built this mat to be the ultimate yogi companion. They wanted to reduce slipping to minimize injuries and eliminate the use of a towel during class. It’s also machine washable. This is an open cell mat made with eco-friendly, biodegradable, 100% natural tree rubber and water-based inks. It has a microfiber top and a tree rubber base. It’s free from silicone, toxic glue, and phthalates. The Combo Mat measures 70″ x 24″ is 3.5 mm thick making it the thinnest mat on my list. However, it weighs 4.1 pounds so is denser than some of the other mats that are slightly thicker. 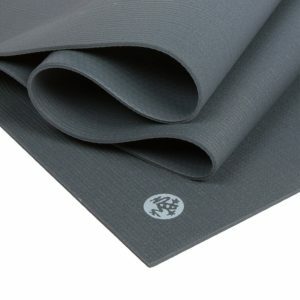 Yoga Design Lab says the mat is odorless but some reviews mention it had an odor and that it didn’t compare at all to the smell of other tree rubber mats. Reviews also mentioned that it often smells good because they spray with essential oils and or wash it. These mats were made to stand out and there are 9 bold prints available. Yoga Design Lab was founded by Chad while on a trip to Bali. He noticed the packed yoga class he was in was a sea of unoriginal, solid colored mats and wanted to change that. He blends fashion with function and bio-renewable resources to create mats and accessories for yoga. They also give back to Urban Youth Yoga Programs in need for each purchase made. This is one of the better selling wholesale mats I found. It may be an option to consider for people that want many mats for minimal cost. This is an open cell mat comprised of PVC. It is free of latex and heavy metals. The Deluxe Yoga Mat is 74″ x 24″ and 6.35 mm thick. It ties with the Aurorae Classic as the thickest mat on my list but is only 3.8 pounds, so not incredibly dense. Some reviews complained of an odor, others didn’t think it was an issue. With 27 colors available, you’ll have plenty of choices to pick from. This might be fun for a studio looking to match a brand color. Yoga Accessories searches for craftspeople, manufacturers, vendors, designers, and entrepreneurs that offer goods and services to customers who value the environment, a sustainable economy, healthy living, and alternative healthcare. YogiMall created this mat to work for different types of yoga practice, including hot yoga. It is made with various materials that provide breathable, grippy support. This mat has an open cell top made of jute and a closed cell bottom made of eco-friendly PVC. It also has antimicrobial additives to resist bacteria and help minimize odors. The YogiMall mat is 72″ x 24″, 5 mm thick which puts it right in the middle of the pack for size. But at 3.74 pounds it’s on the lighter side of the options I have listed here. This mat is designed to be odorless and the review I saw said that there was not a noticeable smell. This mat comes in 3 different color options. YogiMall’s goal is to sell environmentally friendly products that are high quality and reasonably priced. They are committed to superior customer service and therefore offer a 100% money back guarantee. prAna designed this mat with lightweight, non-toxic materials to give you a better grip. It has two sides and superior cushioning. This is the only closed cell eco-friendly mat on my list which means it doesn’t absorb germs, moisture, and odors like open-celled mats. The prAna E.C.O. is made with 100% Thermoplastic Elastomer (Tpe). It’s UV resistant, lightweight, PVC free, chloride free, and latex free. They use all non-toxic materials during production. The size of the E.C.O. is fairly standard among this list measuring 72″ x 24″ and 5 mm thick. It is, however, the lightest mat on the list weighing only 2.2 pounds. The few reviews I found that mentioned smell said that there either was no smell or that it was faint initially and faded fast. There are just 2 4 color options available. prAna started back in 1992 when Beaver and Pam Theodosakis were sewing their own clothes. Their company has grown as they yoga community expands. Their mission is to inspire healthy, active, and free-spirited living. prAna also bakes giving back into their business model and contribute to local and international charities throughout the year. They continue to make products that they want to use themselves. As I dug into researching the best mats on the market, I realized there are several factors that are important to consider while buying a mat. I understand that in a world of yogis, things like company values, environmental impact, and material type would likely be information you’d find helpful while making this investment. To help clarify some of the factors I referenced for each mat above, I’ve described them in this guide to help you choose the qualities that matter most to you. Open cell mats are a bit like a sponge, they absorb moisture which is sometimes referenced as a benefit for hot yoga. I did notice however that some of the open cell mats got reviews about collecting too much sweat and becoming a puddle. These mats typically need to washed regularly. Please look for specific care instructions for the mat you choose though, some can be machine washed and others must be washed by hand. They all need to hang dry. Another note about open cell mats, since they absorb moisture, they also absorb bacteria which can sometimes make for a smelly mat if it’s not being cleaned regularly. Closed cell mats, as you can probably assume, do not absorb moisture or bacteria. 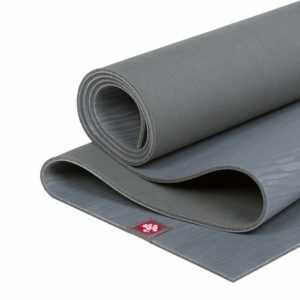 There are only three closed cell mats on my list, two of which are Manduka’s and the number one complaint I found about them is that they are slippery – especially during hot, sweaty yoga. Some mats now combine materials and are both; open celled on one side and closed on the other. It’s important to think about your yoga environment, practice style, and willingness to spend time maintaining your mat when considering this factor. 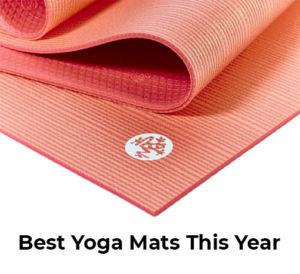 There are many different materials used for the mats on this list. While doing my research, I tried to find a variety of price options as well as different materials. If you have sensitivities to certain materials, please check the make up of a mat before you make your purchase. Biodegradable mats will decompose once disposed of. Tree rubber is a renewable resource. PVC is not biodegradable so if you choose a mat made with this, it’s important to choose one that’s going to last a really long time so it’s not polluting the land fill. Some of the mats on the list are thick, but very light weight, therefore they’re reality squishy under you. This might be good if you’re looking for cushion but it’s likely to feel more unstable than mats that are more dense.